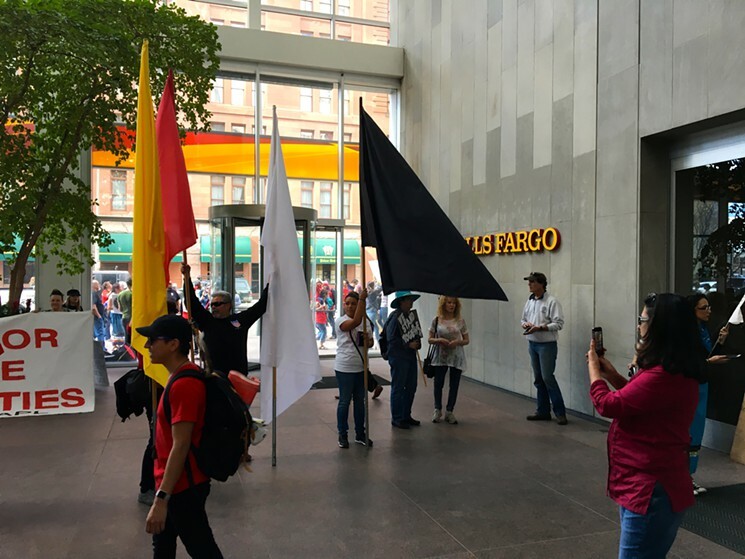 When Wells Fargo employees and security guards saw more than one hundred indigenous activists and allies marching down Broadway from the State Capitol to Wells Fargo’s corporate office at Broadway and 17th Avenue, they tried to seal off the building. Instead, natives burst through one of the front doors. A brief scuffle with security guards ensued, but the entrance was successfully breached; dozens of demonstrators streamed inside. 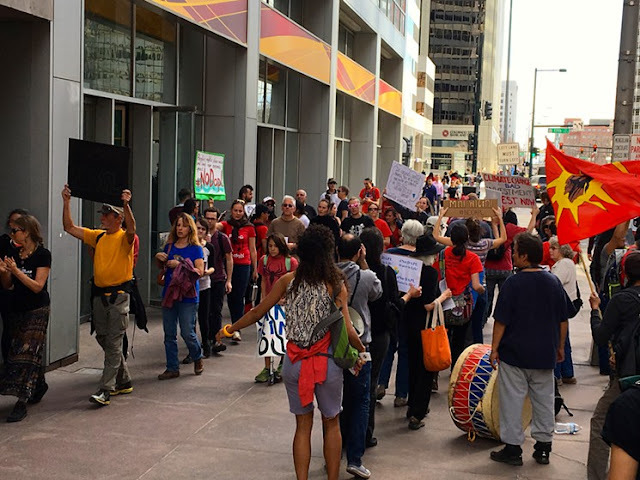 “Native treaties, native rights, hey Wells Fargo, water is life!,” they shouted. For the next half hour, the main bank branch of Wells Fargo was completely shut down while indigenous activists and allies demonstrated in front of stunned bank employees. 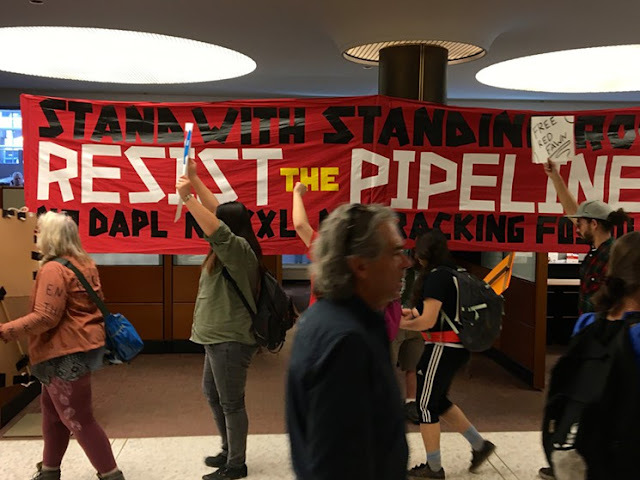 The action was in support of efforts in North Dakota at Standing Rock to oppose construction of the Dakota Access Pipeline, which poses environmental threats from oil spills that would contaminate surrounding rivers and water sources. 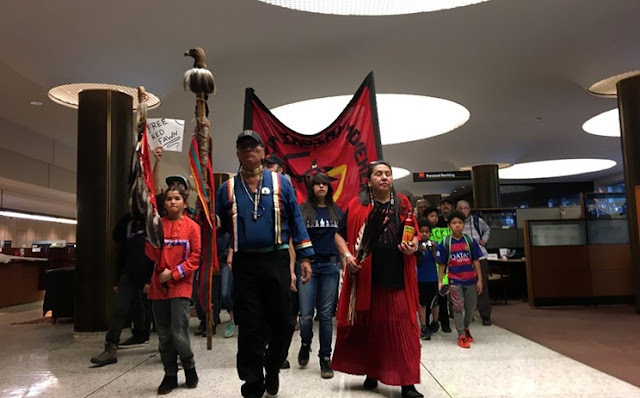 The path of the proposed pipeline also takes it through areas that the Sioux maintain was Indian country under the Fort Laramie treaties of 1851 and 1868 – treaties they say were broken. The bank is one of the principal financiers of Energy Transfer Partners, the corporation behind the pipeline. With that, the demonstrators left the building; there were no arrests. Once outside, they joined dozens of protesters who had been picketing along the sidewalk of Broadway. Responses to "Native Americans Shut Down Wells Fargo in Downtown Denver"